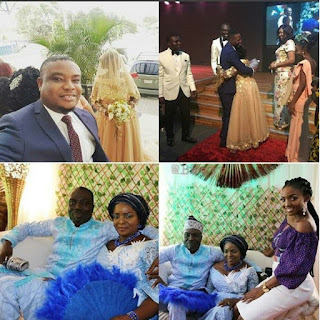 Early this year, there was a viral report that Ms. Jedidiah Ogunleye ‘Love don’t care’ crooner, Simi’s mum will be getting married this January. Ms. Jedidiah Ogunleye and her estranged husband got separated in 1997 and she’s been single ever since. Simi’s mom who shared the testimony of her engagement at church on the eve of the New Year, said: “I joined this church for over 20 years as a sinner. I will like to say a big thank you to Pastor Sam. My desire has always been to get married. Every Sunday, I’m always ushering couples to their seat and I love to see these couples ushered into the church because marriage is something I so much desire. you may never find a man of your age in that church.” But I trusted God too much. the congregation was already screaming and Simi’s mom had to keep the congregation quiet in order to be heard. She was full of great excitement as she showed off her ring to the whole church. Well today, the singer’s mum walked down the aisle and Simi played Chief Bridesmaid role at the event.